architectus, CHROFI and JMD design have collaborated on the re-design of Harbord Diggers Club in Sydney. 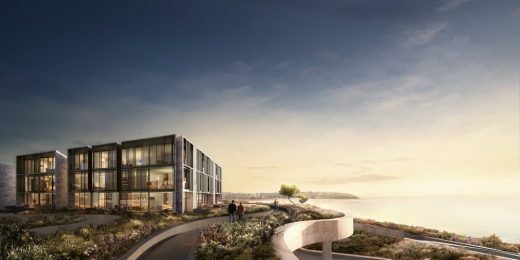 The project is sited on one of the city’s iconic headlands surrounded by spectacular coastal sandstone formations and textured by native coastal landscape. Architect offices based in Auckland & Christchurch (New Zealand) ; Sydney, Melbourne & Brisbane (Australia) ; Shanghai (China). The architecture studio was established in 1979. This architecture practice is led by architects Kerry and Lindsay Clare. The work of this architecture firm has been included in over 150 national and international books, periodicals and publications. Exhibitions of their work have also been held in New York, Tokyo, Sydney, Melbourne, Perth and the 1991 and 2008 Venice Biennale, the 1996 Milan Triennale (Italy) and the 1996 UIA Congress, Barcelona (Spain). Lindsay and Kerry were appointed as Adjunct Professors, Faculty of Architecture, University of Sydney, New South Wales, Australia from 1998 to 2005.